Established in 2013, the Hong Kong Human Rights Art Prize (HKHRAP) has played a pivotal role in discovering and encouraging Hong Kong artists to explore the state of human rights both at home and abroad. The prize is run annually and open to all Hong Kong artists who submit artwork around the theme of local or international human rights. 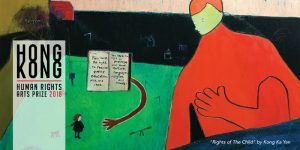 Recurring themes in artworks exhibited and auctioned in previous years include the Occupy movement, the environment, homelessness, the plight of refugees, forced labour, ethnic minorities and LGBT rights. Entries are judged by an esteemed panel of experts from Hong Kong’s art and visual arts community. “We hope the Hong Kong Human Rights Arts Prize allows us to engage with more sectors of the community, working with artists, institutions, the education sector, media, galleries and corporates, while raising awareness and much-needed funds for the front-line work of Justice Centre Hong Kong,” says Piya Muqit, Executive Director of Justice Centre Hong Kong. On December 8, the Hong Kong Human Rights Arts Prize HKHRAP will host the much-awaited awards ceremony co-presented by the European Union in Hong Kong and Macao showcasing 23 shortlisted artworks from a pool of 126 mixed media pieces. The winner of the HKHRAP 2018 will receive one of Asia’s most prestigious art award packages, featuring a cash prize of HKD35,000 and a bespoke trophy by prominent Hong Kong artist Jaffa Lam. Two runners-up will also receive cash prizes, and a Directors’ Choice Award will also be presented at the exhibition opening. All prize money has been generously donated by sponsors. Each of the exhibited works will be available for purchase via auction platform, with all proceeds supporting the important non-profit work of Justice Centre Hong Kong. The winning artist will be available for public viewing at Eaton’s gallery space ‘Tomorrow Maybe’. Join us at the opening event and show your support to artists hailing from a variety of backgrounds and communities. Pre Registration Required – BOOK YOUR TICKETS NOW! The HKHRAP 2018 follows a record-breaking 2017 edition, which saw the highest number of entries and exhibition attendance in the history of the prize. In addition to playing a longstanding role in unearthing artistic talent in the city, the HKHRAP has successfully engaged the civic imagination and established itself as an important cultural platform in Hong Kong. Since its launch, the HKHRAP has encouraged meaningful dialogue about the state of human rights both at home and abroad. The highlight of the Fringe Event calendar in 2017 was the Hong Kong premiere of Ai Wei Wei’s film, Human Flow. Previous winners have included Elva Lai with her photography project entitled ‘Family Photo Album: Washing‘ conveyed Hong Kong’s shared history as refugees; Christy Chow with her installation ‘De-stitching’ part of a larger series looking at the value of labour in a capitalist society; Filipino photographer Xyza Cruz Bacani; Katie Vajda, for her series on domestic workers in Hong Kong and Ducky Chi Tak, with his piece, 3D Jobs, which deals with ethnic minority and labour rights. The HKHRAP 2018 will be led by Hong Kong-based artist and 2014 Arts Prize winner Katie Vajda (@katievajda) and Peter Augustus Owen (@peteraugustus), Associate Director, Perrotin. Follow us on Instagram and Facebook for this year’s HKHRAP updates!